Correction: This story has been updated to reflect that the state of Michigan received land Indian tribal land in return for pledging to put native people through college. It also corrects the number of students enrolled through the program at Central Michigan University to 165. This story and graphic also have been updated to correct the amount of state funding to the Indian Tuition Waiver program. 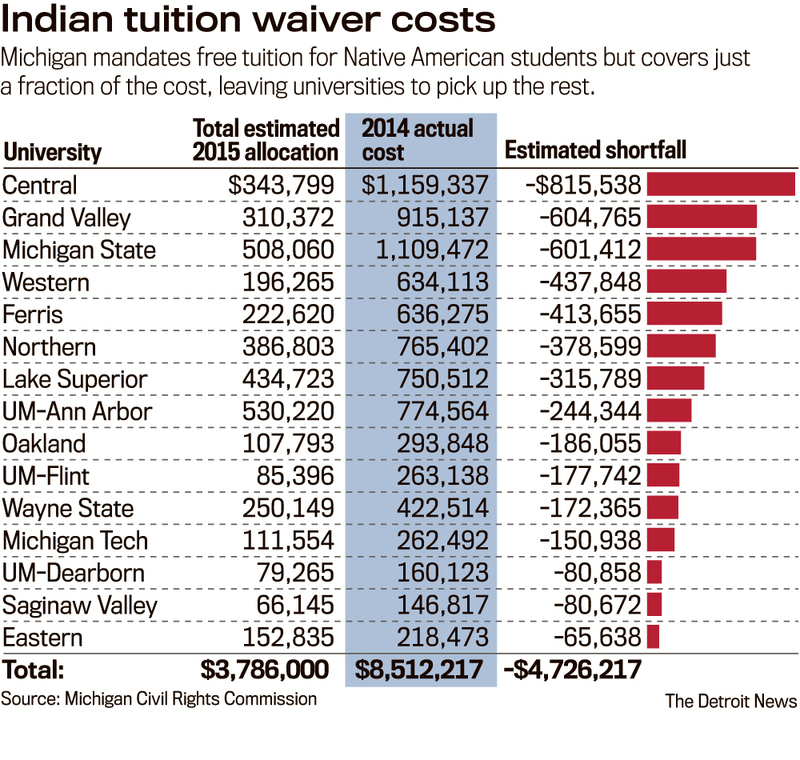 A little-known program provides free tuition to Native American students at Michigan’s public colleges and universities, but lawmakers have failed for years to fully fund the program. As a result, the schools are on the hook for millions of dollars each year. The situation has led some advocates to say the state isn’t fully honoring a promise made more than 80 years ago, when Michigan received land Indian tribal land in return for pledging to put native people through college. Last year, the state’s 15 public universities had to spend $4.7 million to subsidize tuition for Native American students because the state allocated only $3.8 million for the $8.5 million program. Now, a growing chorus of university officials and Native American leaders are calling on the state to fully fund the Michigan Indian Tuition Waiver program, which serves more than 1,000 students each year and survived periodic attempts in the legislature to abolish it since it was enacted in 1976. University officials say the funding gap puts an unfair burden on state schools and hurts efforts to help indigenous people advance. Pleger is lobbying for change since LSSU is among the schools hardest hit by the funding gap. In 2014, the program cost more than $750,000 at the Upper Peninsula school, but the university is slated to get just under $435,000 from the state this year for that purpose. Some lawmakers have tried to fully fund the $13 million program. In the past 10 years, state lawmakers twice increased appropriations for the program, but neither hike was enough to close the gap. State Rep. Jeff Irwin, who has Ojibwe ancestors, offered an amendment during the last budget cycle to fully fund the program. Even though it was shot down, Irwin, a member of the House appropriations subcommittee for higher education, has vowed to try again next year. A program unlike any other nationally, the Michigan Indian Tuition Waiver program is open for Michigan residents who are at least one-quarter Native American, allowing them to attend any of the state’s 15 public universities and 28 community colleges for free. Only two other states have a similar program, and neither is as broad as Michigan’s. One in Colorado, where native students can get tuition waived at Fort Lewis College in Durango; another is at the University of Minnesota-Morris. Michigan’s program is especially popular at universities close to the state’s Indian reservations, such as Lake Superior State and Northern Michigan, where about 100 students receive tuition waivers, and Central Michigan, where about 165 students are in the program. Among those who have benefited from the program is Colleen Green, who was married with three children before she went to college when she was 28 and a bingo worker at Saginaw Indian Chippewa Tribe, earning $8 an hour. Today, Green has earned an associate, bachelor and two master’s degrees and is working on her Ph.D. while directing CMU’s Native American Programs. “It is really beneficial to our tribal community,” said Green, a member of the Little River Band of Ottawa Indians. She added there are a lot of drugs and alcohol on the reservations and it helps to have educated members mentor others toward better lives. “I’ve seen students turn their lives around from high school to college because they had people who were highly educated in our community,” Green said. The roots of Michigan’s program date to 1934, when Native Americans agreed to shut down a boarding school in Mount Pleasant so that Central Michigan University could expand, according to Payment. The native boarding schools were part of a national movement aimed at educating native children so they could get training in a skill to sustain a livelihood. In shutting down the exchange, the state agreed to fund higher education for Native Americans. The transfer of land was detailed in a document known as the Comstock Agreement, negotiated by the U.S. Secretary of the Interior and approved by Congress. Yet more than 40 years passed before lawmakers, under Gov. William Milliken, legislated the Indian Tuition Waiver agreement into law. For its first two decades, the program was funded through a line item in the state budget. But when Gov. John Engler threatened to veto funding for the waiver, the line item was converted into individual appropriations for each school. The payment to each university was calculated based on the cost at that time. But as more native students sought higher education, the reimbursement didn’t change and that is why a shortfall evolved, Payment said. For many of Michigan’s Native Americans, the program is a lifeline to a better future. Angie Shinos had aspirations of heading the casino or other businesses owned by the Grand Traverse Band of Ottawa and Chippewa Indians, the tribe to which she belongs. After working there for years, she said she realized she likely wouldn’t break into the “boys’ network” even with her bachelor’s degree education from Michigan State University, so she went back to MSU to get a master’s degree. Shinos has since joined Consumers Energy as a business analyst, with a career that offers advancement opportunities, and a salary higher than she ever expected to earn.